Are you saying you've read it and would reccomend it? Or just that you've heard about it and it looks good. I'd like to encounter Jesus like I encounter anyone else, someone I get to see and hear and touch, not to mention converse with, in give and take conversation. So far I haven't "met Jesus." I used to think I "felt his presence," and that I knew a whole lot more about Jesus and that he was "talking to me through Bible passages." But I grew less certain of that over time. Many evangelical Christians boast that they have a “personal relationship” with Jesus. What makes it so “personal?” Well, they say, we have the words attributed to Jesus in the four Gospels. But there are so few of them, a couple thousand. You could fit all of Jesus’s words into a small 16-page booklet. And they are subject to interpretation. Well, they say, there are “answered prayers.” But again, that is a matter of interpretation, because no matter what happens, an evangelical Christian interprets it as “Jesus’s will,” even when bad things happen to good people and good things happen to bad people. Whenever I have a “personal relationship” with someone it does not consist of a few thousand words spoken two thousand years ago, recorded accurately (or inaccurately) by someone else, and which require interpretation from third parties for me to “truly” understand them (especially when the third parties disagree concerning the meaning and intent of those words). Today I tend to view life is a do-it-yourself project. I like a lot of what you say. I think there is a tension, both in real life and in the narrations of the Jesus story in the gospels. On the one hand, I think we need a real (whatever that may mean) experience of Jesus in order to be possibly able and willing to commit ourselves to him. On the other hand, the bible seems to challenge us that we can have such a personal encounter with this Jesus in the reading of the bible. Let's take Thomas, one of Jesus' original disciples. If we read John's gospel, ch. 20, verses 24-29, what now is precisely his difficulty? I think his difficulty was not the resurrection of Jesus from the dead per se, but that he had to accept it on the basis of the testimony of his fellow disciples. He wanted to see the evidence for himself. The Thomas account is our story. Many people want to see, hear or touch Jesus for themselves, but they may not realize that this can actually happen in the reading of the bible. In the act of reading, I think we can encounter Jesus in a real way, although this is not the only way of meeting Jesus of course. 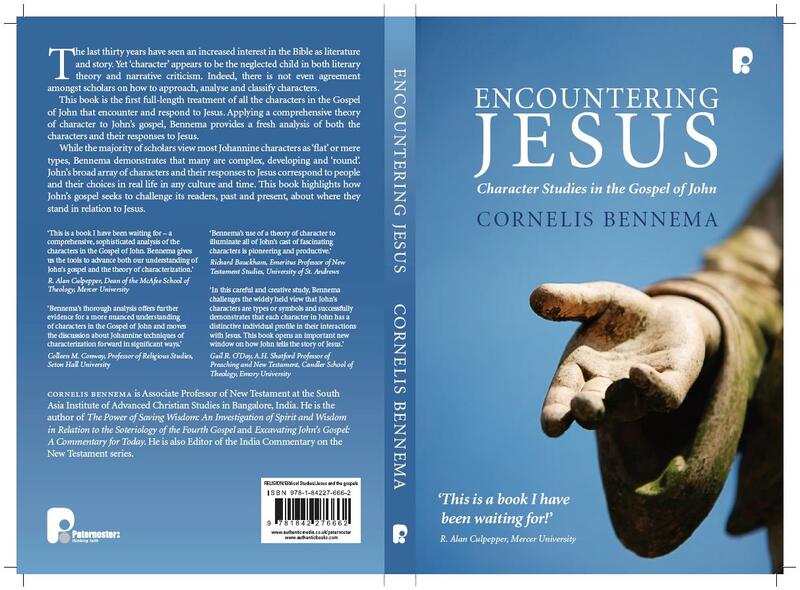 The aim of the author of John's gospel is to persuade people to believe in Jesus, and I think he achieves this by letting various characters/people interact with Jesus. But the author is not neutral; he wants the reader to adopt his point of view, which is to believe in Jesus as the one who gives life and freedom. In this process, John also prods the reader, saying, 'Hey, where do you now stand with Jesus?' That is in short what my book is all about. Does this make sense? Like most who find scripture lacking due to the translations, interpretations, and one who desires to see Jesus in physical form so you can touch, see, and hear Him to believe and have a relationship with...you may not experience anything positive to hold on to. This is about faith. Faith in One you cannot see at this time. But like in most of our walk in life...we continue walking not really knowing what's ahead. But we keep walking and trusting that maybe we will find our walk will take us to where we are safe. For those of us who believe, we are being changed into the image of Christ. Slowly but surely. Maybe you don't have to look too far to have an encounter with Jesus. But again...that takes faith. And as you know, you can ask for that. Mrs Olivia, not read it yet, but I know the author.